Scanner offers a versatile scanning solution to offices that require both batch scanning and scanning of various media formats to tackle a variety of tasks. 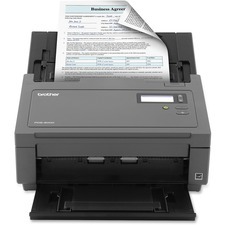 Included bundled software lets you access various scan modes, including connection to cloud-based services, so documents can be uploaded and shared effortlessly. The flatbed can handle up to legal-size documents as well as different types of media formats, such as books, magazines, plastic or embossed cards, and fragile documents, and convert these to a digital format for easy office or personal organization and sharing. User-friendly control panel allows simple, one-touch job operations, such as start and stop scanning, copying, filing and e-mailing documents. High-quality imaging technology enhances text legibility, including light-colored text on light-colored backgrounds. ISIS/TWAIN drivers provide easy integration with third-party software or content management systems. 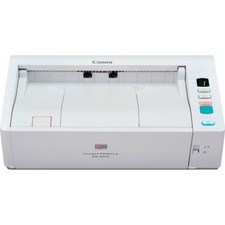 With its small size and flexibility, this scanner is perfect for use in various industries such as legal, healthcare, financial and real estate. The built-in wireless capability allows you to scan across various devices. Plus, it can be used by individuals or shared by small workgroups to modernize paper-based processes to increase efficiency and productivity. Slim, narrow design is excellent for environments where desk space is at a premium. Flexible operation scans both sides of a document in a single pass to save you valuable time when scanning multiple items. Wireless functionality helps reduce cable clutter and broadens connectivity options. The bundled Canon CaptureOnTouch software lets you assign Scan-To-Job buttons to pre-configured scan tasks for quick, easy access. High image quality helps enhance and maintain the image quality of an original document rough a variety of accessible features. 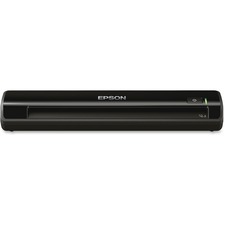 Scan, save and send important data wherever your business takes you with this portable document scanner. 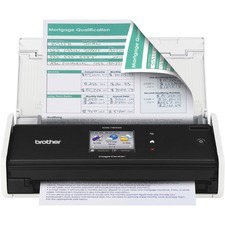 Delivering full-function flexibility on-the-go, this scanner is capable of scanning receipts, documents, plastic ID cards and more right into an e-mail, searchable PDF and more. Send your scanned files directly to the most popular cloud services with the included software. Correction tools allow you to automatically remove punch holes from scanned images, auto-size documents, enhance text quality and correct image skew so you can keep your business moving when you're out on the road. 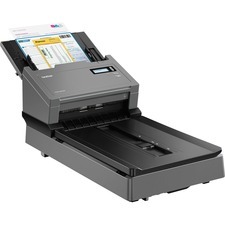 Perfect for busy professionals, this single-side scanner is ready to perform whenever you are. 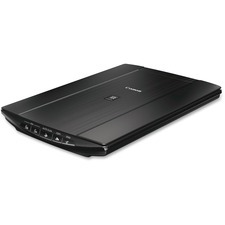 Scanner is USB-powered so you don't need an external power supply. It is compatible with both Mac and PC computers. 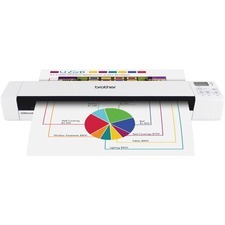 This color image scanner offers advanced features that are easy to use. With a maximum optical resolution of 4800 x 4800 dpi, its 48-bit color depth is capable of producing more than 281 trillion possible colors. Auto Document Fix automatically produces beautiful scans with advanced image analysis and area-by-area data correction. Auto Scan Mode automatically evaluates the item being scanned and saves it with the appropriate settings. Work efficiently with five EZ buttons that enable you to scan, copy, Send to Cloud, or create a single or multipage PDF. Create a letter-sized color scan in approximately 10 seconds. Plus, it comes with a stand to enable vertical scanning. Advanced Z-Lid expansion top extends up approximately 1" to let you scan large items. 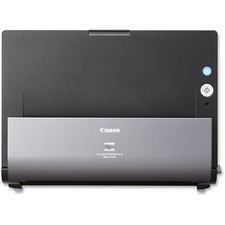 This color scanner uses one USB cable for both data and power so plugging in is easy. Included My Image Garden, a convenient software package, makes organizing your photos fun and easy. 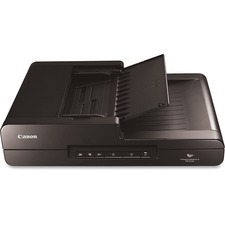 This high-volume color document scanner features speeds of up to 60ppm (Color and monochrome scan speed with all advanced features turned off, LTR at 300dpi. ), single-pass duplex and a 100-sheet capacity document feeder. SuperSpeed USB 3.0 connectivity with optical resolution up to 600 dpi enables precision reproduction. Various advanced scanning features include edge cleanup, hole punch removal, multi-feed detection with reversing roller and batch bar code separation.